Were the records of the government of India for those years ever to be thrown open, one might find such loyalty oath, extracted under pressure by senior officials, were very nearly ubiquitous. As I noted in this blog, I did find a factual error and at least one inconsistency in the book–but those are minor quibbles, which will probably be corrected in the next edition, any way. Thus, India after Gandhi, for me at least would always remain a constant source of reference. Having said that, to write the sixty years of history of India within 750 pages or so is an impossible task. So, I have a feeling that each chapter, and each section of Guha’s book can probably be expanded into a monograph. For example, I knew that Gen. A S Vaidya was involved in Operation Bluestar, since he was assassinated by Khalistan separatists after his retirement; but, there is no mention of him in Guha’s book. So, I believe that the book is sketchy than detailed. But, like the sketches of R K Laxman, it is a sketch that does more justice to the subject than even a photograph. So long as the constitution is not amended beyond recognition, so long as elections are held regularly and fairly and the ethos of secularism broadly prevails, so long as citizens can speak and write in the language of their choosing, so long as there is an integrated market and moderately efficient civil service and army, and — lest I forget — so long as Hindi films are watched and their songs or sung, India will survive. With that, I will say my “So long” to the book that brought so much of joy and excitement to me in the past few weeks. Viswanathan Anand of India is the new world champion. Anand, the world’s top-ranked player, won the World Chess Championship in Mexico City that ended yesterday. He dominated the 14-round event, winning four of them and losing none through Round 13. This is the second time Anand has been world champion. In 2000, he won the World Chess Federation’s championship, held in Tehran and New Delhi. At the time, however, there was a rival claim for the title, and Anand was not universally acknowledged as champion. This time is different. The title was unified last year, and there is only one champion. In Mexico City, Anand was in trouble only once, in Round 3 against Vladimir Kramnik of Russia, the defending champion. 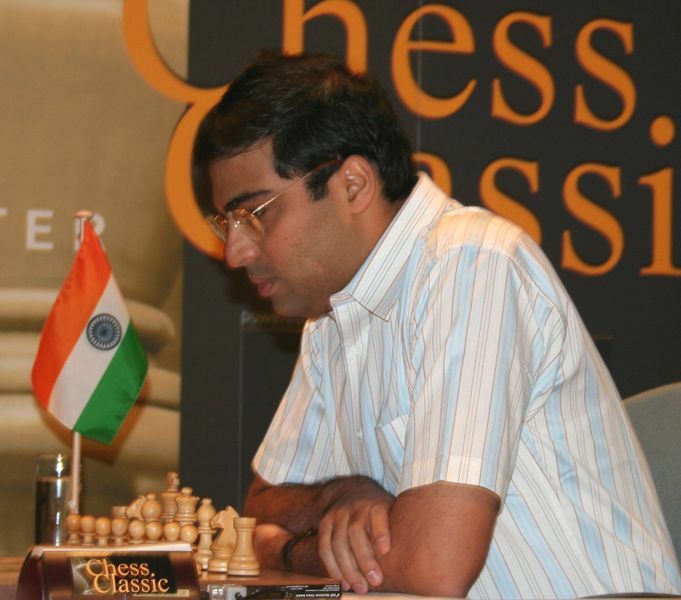 Throughout the tournament, Anand demonstrated superior preparation and resourcefulness compared with his competitors. From NYTimes; detailed score cared of the entire tournament is available in a series of posts by (at) Shencottah. For me, science is just a box of tricks, and I enjoy playing with them. It’s a form of exercise. It has nothing to do with philosophy, certainly even less to do with religion. It’s essentially just a skill that I happen to have learned. Some people think about science much more solemnly. For me, science has nothing much to do with deep thoughts. There is this very strong organization, the IPCC, the Intergovernmental Panel on Climate Change. It’s a group of officially anointed experts who produce statements every five years. This community of people is regarded as sacrosanct. And they’re very intolerant. They always regard any criticism as a hostile act that has to be fought. I think they have behaved pretty badly. But that’s rather an unusual case in the world of science — that’s where the politics has corrupted the science. But in general, scientists are not largely against heretics. This is something rather peculiar to climate studies. It also has to do with the way [the studies are] funded. The whole community of climate experts is funded on the basis that it’s an urgent problem. So [they] can’t possibly say it’s not urgent or else they’ll lose their thumbs. It is a long interview, running into three pages. Take a look! From this excerpt in the Hindu of an Introduction to a book compiled and edited by Gopalkrishna Gandhi that describes Gandhi’s story in his own words (with some nice photographs too). Kluwer Academic Publishers, NY (2004)). 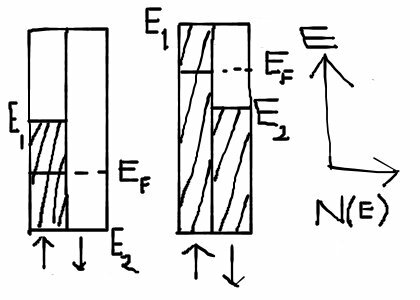 Consider a 3d transition metal, in which the 3d electrons give rise to magnetism; since the electrons are itinerant (and delocalised) in the metal, the magnetism stems from 3d electron bands. For simplicity’s sake, let us further assume that the 3d bands are rectangular (which means that we are assuming that the density of electron states is a constant over the entire range spanned by the width of the band). The band itself consists of two sub-bands — one for up-spin electrons and another for down-spin electrons. If there are less than ten 3d-electrons in the system, the 3d-band will be partially filled. Further, if the system fills these bands without discrimination, then both the sub-bands will be equally filled. However, if suppose we can define an interaction energy which indicates a reduction in energy if the electrons from one of the sub-bands, say those corresponding to down-spin can be transferred to the up-spin band, then, under certain circumstances it can be shown that this will lead to an instability as discussed below. However, what prevents such an emptying of one of the sub-bands in favour of another is the resultant increase in the kinetic energy of the electrons. In fact, the total variation in energy in such sub-band transfer of electrons can be shown to be equal to , where, is the total number of 3d electrons per atom, is the fraction of atoms that move from down-spin sub-band to up-spin sub-band, is the effective interaction energy, and is the density of energy states at the Fermi level. Thus, if the quantity in square brackets is positive, the state of lowest energy corresponds to — or, in other words, the metal is non-magnetic. 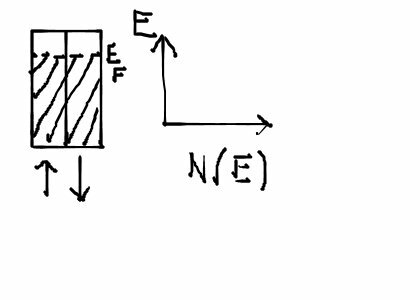 However, if the quantities in the square bracket is negative, the band is “exchange split” — , and hence the metal is ferromagnetic. This is known as the Stoner instability, or sometimes ferromagnetic instability. From the equation, it is clear that such band splitting is favoured for large exchange interaction energy as well as for large density of states. Since the density of states for s– and p-bands are considerably smaller, which, in turn explains why such band magnetism is restricted to elements with partially filled d-band. 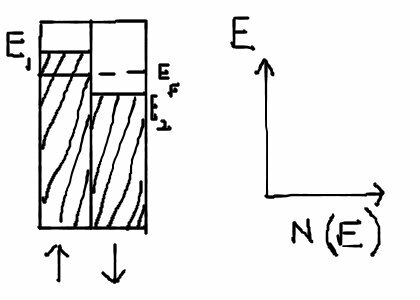 Strong ferromagnetism with systems in which the d-electrons per atom are less than five, and great than five respectively. Well, some of you who know me well, might be smiling — I know that it is rarely, if ever, I had breakfast or came to the lab in the mornings; and, if it rained the previous night, I would most probably have been sleeping at 9:00; however, though my visits to the coffee house under the circumstances that I describe are few and far in between, when I think about my visits to the coffee house, that is the picture that comes to my mind–that, and the rare occasion when Abdul Kalam was in the queue along with us. Dear readers, if you are wondering what suddenly led me to all this coffee-algia (as in nostalgia, an acute coffee sickness–as the Oxford dictionary entry explains, originally in the sense acute homesickness : from Latin, from Greek nostos ‘return home’ + algos ‘pain’. ), it is this musing of Guha on his visits to the coffee houses (and the Eurozine piece that led Guha to his musings is here). Happy reading (and many more cups of the divine drink)! While film directors and actors were influenced by the nationalist movement, that movement was supremely indifferent to them. The producer of Achhut Kanya was unable to get the lifelong crusader against untouchability, Mahatma Gandhi, to watch this film. (Apparently, the only film Gandhi saw–and that not till its end–was a mythological work, Ram Rajya.) Nor is there any record of other leaders like Jawaharlal Nehru and Vallabbhai Patel visiting movie theatres. I can understand Gandhi, and at some level Patel too; but Nehru? I expected him to be an ardent movie fan (and, needless to say, I am disappointed). What is the purpose of a research plan? How do I tell a good story? How do I make my research plan seem real? How do I demonstrate my independence? How do you demonstrate your independence when you have never been given the chance to work independently? Is the research plan more important in the screening phase or late in the game? How do I make my plan withstand careful scrutiny? Should I include a research hypothesis? A must-read essay (and hat tip to Dr Aparna Bhatnagar of Post-doctoral affairs for the email alert). PS: Just for the sake of reference, here are some of my earlier posts with links to some other resources on grant proposal writing. Wow! I must read that book! In 1977, the year she passed away, Kesarbai Kerkar’s unforgettable rendition of raga Bhairavi, “Jaat kahan ho”, literally reached the celestial heights. This happened not because of her divine vocal talent (Tagore had conferred on her the title, “Surashri”, after an earth-shattering performance in Calcutta), and turned out to be a different kind of apotheosis. In fact, it was the Voyager spacecraft that carried her recorded voice to outer space, along with a selection of several other immortal melodies. Many years later, Namita Devidayal learnt about this fascinating journey from a mischievously cryptic remark made by her guru, Dhondutai Kulkarni: “Did you know that Kesarbai’s music is circulating through the solar system?” “I gave my teacher a bemused look,” Devidayal confesses, “but suspended disbelief for the story that would follow, for I knew it would be charming, even if apocryphal”. From Somak Ghosal’s review in the Telegraph of Namita Devidayal’s book The Music Room. This is the first time I am reading this story–even Sheila Dhar does not inform us of this facet of Kerkar’s music; and, just for this story, I would like to own The Music Room. I am of the post-memorization generation of literature people — I might have memorized a couple of poems in high school, but in college no one asked to memorize a damn thing. As a result I can only recite from memory a couple of Yeats poems and Shakespeare sonnets, which would probably horrify some senior people in my field. We were not that lucky; during our school days, certain poems were identified for memorising and we were supposed to get up and recite them in our Tamil and English classes; if failed, much humiliation would follow. Apart from such curriculum based memorisation, we also memorised lots of Sanskrit shlokas at home. However, during our college days, much like Amardeep, we were not expected to memorise anything. But, by then, I was among a few students who liked memorising poems, and discussing them. So, on my own volition, I did memorise lots of Bharathiar and Andal. I do not know about their neurological benefits; but, it does come handy to know some poems by heart.